Roger Federer and Milos Raonic go face to face in the men's singles semi-final clash of the 2016 Wimbledon Championship on Friday. Who will reach the final? Don't miss our RAONIC v FEDERER betting preview, with predictions, expert tips, highest odds, bookie offers and no deposit bonuses on Wimbledon. Ranked number seven in the world, Milos Raonic played probably the best game of his career beating American Sam Querrey 6-4, 7-5, 5-7, 6-4 to progress to the semi-final last time out. The Canadian star hit 58 winners and committed just 16 unforced errors in his quarterfinal victory against Querrey. The Canadian eased past Pablo Carreno Busta, Andreas Seppi and Jack Sock in the opening rounds and came back from 2 sets down to record an impressive win over David Goffin in the last-16 round. Roger Federer came back from two sets down to beat Marin Cilic in the quarterfinals, 6-7 (4), 4-6, 6-3, 7-6 (9), 6-3. He entered the tournament with a lot of questions about his form but was handed a very favourable draw. In the first round he beat Guido Pella 7-6 (5), 7-6 (3), 6-3 in a competitive match. Then, the Swiss maestro saw off Marcus Willis, Daniel Evans and Steve Johnson without dropping a set. Federer and Raonic have faced each other 11 times at Grand Slam and ATP Tour events, with the Swiss maestgro winning nine of those matches. They last met in the final of the 2016 Brisbane Open with Raonic beating Federer with a double 6-4. With Federer two years older and Raonic much-improved, mentally tougher, and tactically sounder since that 2014 encounter, a much more competitive contest should be in the cards. 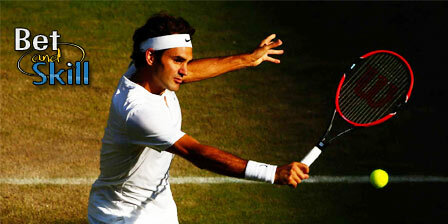 Federer will be competing in a remarkable 11th Wimbledon semifinal and he is 10-0 so far! ComeOn UK offer £5 no deposit free bet to all BetAndSkill readers! Get a €5 no deposit bonus on eSports with Tipbet! "Raonic v Federer predictions, betting tips, odds and free bets (Wimbledon - Semifinal - 8.7.2016)"